The Lighthouse | Jerusalem is Our Capital – Trump appreciated, bold and gallant, but not the issue. The reaction worldwide has ranged from hysteria and fantastical threats of doom to near euphoria among some in Israel. The hysterics less concern me at the moment, but a note to my more level-headed compatriots is warranted. The words reported, for and against the declaration, share in common the implied belief that the recognition of Israel’s capital by the USA will make what it declares, a fact. How sad that so many of us believe it. The only fact such a recognition would add to the universe of facts is that such a declaration was made. One would think it would suffice to say that a country determines its own capital. That to the feared pariah states of the world, this common courtesy is extended and de facto state of affairs is recognized. Tehran is Iran’s capital and Pyongyang that of North Korea. On the ruins of Tenochtitlan sits Mexico City, Distrito Federal, while the marxist ANC manages its corrupt regime from not one, but three perfectly recognized capitals, Pretoria as Administrative, Cape Town as the legislative capital and Bloemfontein the Judicial. The Saudis still maintain their capital as Ryadh, though in 1925, they took control of Islam’s holiest cities of Mecca and Medina from the Hashemites who had held it as Sherifs for a thousand years. Why keep them subordinate to Ryadh? Because they feel like it (and Ryadh is the ancestral house of Saud). Others not only chose them but rename them at will, as Rhodesia’s Salisbury was renamed Harare, from where the murderous Mugabe and his communist ZANU-PF have orchestrated the murder of the white population and the economic ruin of the country. The Turks decided that the ancient city of Constantinople was actually Istanbul, and got the entire Western world to follow suit. So while it would suffice to say that the State of Israel’s capital is Jerusalem, since it has so decided, after liberating and reuniting the city in 1967, there is more that must be said. Jerusalem has been our undivided and eternal capital since King David breached her Jebusite and Hittite defended walls three thousand years ago, while leading our warriors from every Hebrew tribe. In effect it is the first recorded concept of a federal district (such as Washington DC, or Mexico DF), co-owned by many “states”, in this case our Hebrew tribes. No single tribe owned our capital, but rather the nation of Israel as a whole, did so. Not content with sheer military conquest, our holy site was purchased by King David with heavy coin, despite the Jebusite lord’s insistence that the mighty conqueror could have it for free. We often speak of Zion as our 2,000 year old dream. When the Romans vanquished us and took Jerusalem from our heroes who did not number enough to stop the massive empire twenty centuries ago, Jerusalem and her holiness were already ancient to our people. Not only had King David established it as our eternal capital 1000 years before any legion ever reached her gates, but Jerusalem had been our holiest place along with Hebron nearly a millennia even before that… since the days of Abraham who was willing to offer his beloved son to Hashem on Mount Moriah, and where we learned that Gd was not like the petty and vengeful idols of antiquity who required such barbarous sacrifices; in fact, gd abhorred them and prohibited them for eternity. Give or take, we are speaking about 4,000 years ago. The superpower that long denied and now “threatens” this declaration of recognition has been around not even as long as our “give or take” margin of error in that figure. Throughout this period, we have often held Jerusalem, defended it, fought and bled for it, and more often have had to live within her walls under a foreign power. Babylonian, Achaemenid, Seljuk, Ottoman and even British empires have ruled over Jerusalem, but Jews always lived within her walls, while those outside of them prayed to one day return to her. 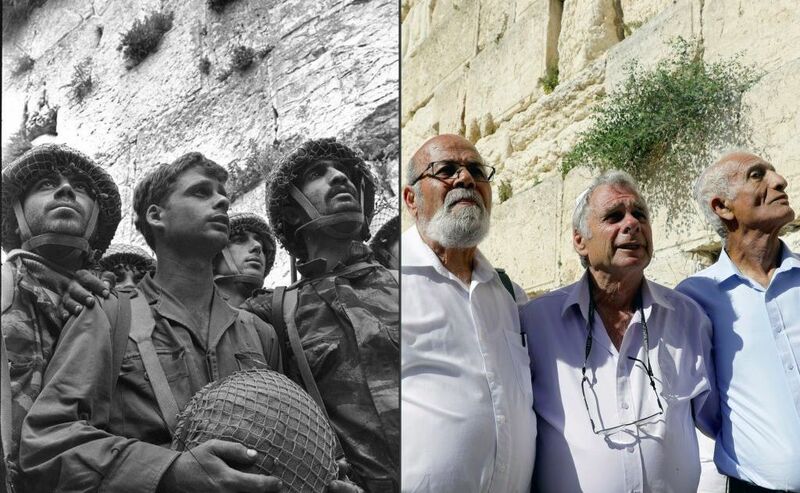 Only for 19 years, were Hebrew prayers not heard inside the holy walls… from 1948 when the Hashemite King’s powerful Arab Legion wrested the old city from our hands, until 1967 when the immortal paratroopers liberated it by defeating the same and now cowed Arab Legion. We never forgot, not since the six hundred years before the common era, when we made this vow. Jerusalem is our capital, eternally and undeniably. We will hold her and protect her while we still have breadth, and even if sometimes we do not, we will always come back to rescue her from the enemy’s hands. Ruling a city or not is a de facto issue. When we did not hold Jerusalem, we wept, but we did not hold her. Today, we do B”H. And deciding which among the cities a state rules is its capital, is a simple decision it makes. We have made it, now and long ago… and thank Gd we hold Jerusalem. Jerusalem is our capital. A word about how we came to hold Jerusalem this latest time around, may we never depart again. The story of the IDF’s victory over the many Arab states that surrounded her in the Six Day War is well known. In some of the fiercest fighting, (the Jordanians as usual, had fought bravely, well and far better than their arab allies), Jerusalem was taken by the IDF. 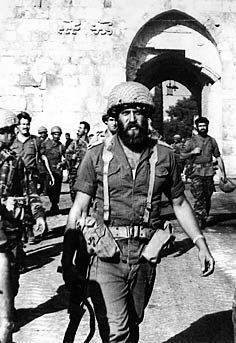 While units such as the Jerusalem and Harel brigades, were essential to the battles around Jerusalem and the West Bank, the brunt of the fighting in Jerusalem proper and the capture of the Old city itself was born with the greatest honor by the Paratrooper’s Brigade. 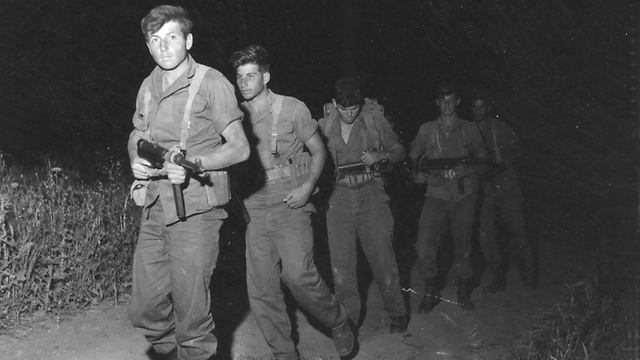 The palmach-type lads with the red Berets (a brigade your humble author was privileged to serve in). 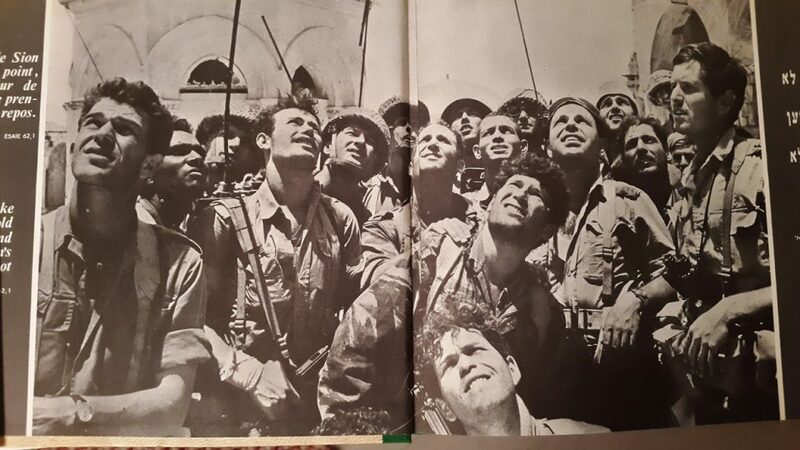 To tell of the heroics in the Six Day war, and even in only the battle for Jerusalem requires serious books, which have been written, but let us contemplate just a glance of the lions of Judah who settles the score with the Romans in those fateful summer days just decades ago. Captain Yoram Zamush (or Zamosh) was the only religiously observant company commander in the 71st battalion of the brigade (and perhaps the only one in the brigade!?). He requested his company lead the assault on the old city. The officers met briefly to make battle plans while still in Israeli controlled Jerusalem (the “new” city), in the home of Mr. and Mrs. Jacob Cohen in bet hakerem street. Zamush asked Mrs. Cohen for an Israeli flag; they had one, which the family flew yearly on independence day from their balcony. After the counterattack against the Jordanians, the breakthroughs across their fortified lines, infamous battles around the old city, around Ammunition Hill, the sausage, the Police School, Augusta Victoria,the museum and many others… finally the paratroopers closed in around the old city. Captain Zamush raced his company, led by his lead platoon commander Lt Yair from Kfar Blum, towards the Lion’s Gate ready to battle his way to the Temple Mount. Even after Kapusta’s commandos, the legendary Meir HarZion and others had fought hard there, Zamush was still encountering resistance from well entrenched Jordanians. The brigade commander Motta Gur who, like many others, could not control the impetus he felt by the weight of suffering and martyred Jews for millennia who prayed for Jerusalem, raced ahead in his half-track and was the first to crash through the fortified gates into the old city (compare to the situation during the second Lebanon war in 2006, when most IDF Brigade Commanders did not even cross the border into Lebanon, let alone lead their men from the front). His driver, a non-combat soldier who was a bus driver in his day-to-day life, Sgt. Ben Tsur, eagerly followed Gur’s commands to charge through the Jordanians and onto immortality. Gur’s gallant, tough and professional second in command, Stempel, followed behind him and afterwards, Zamush and his company. The Brigade commander, his senior staff, and Zamush’s paratroopers raced for the Temple Mount. It remains to be discussed on another opportune occasion the difference between the Temple Mount and the Western Wall, and the fallacies that have been propagated (in large part by our government) about them. Fighting before these fallacies circulated, the paratroopers charged forward first and foremost to the Temple Mount, and not the Western Wall below. Once there (the famous pictures circulated by the government are all of afterwards at the Western Wall), the same blessed Ben Tsur produced a bottle of Whiskey for L’Chaims. Motta Gur declared Jerusalem in our hands over the radio (while the truth was that there was one Brigade Commander and a few lone paratroopers in the temple mount surrounded by Jordanian soldiers entrenched in the old city). He feared the government would order them out if he did not declare victory fast enough. 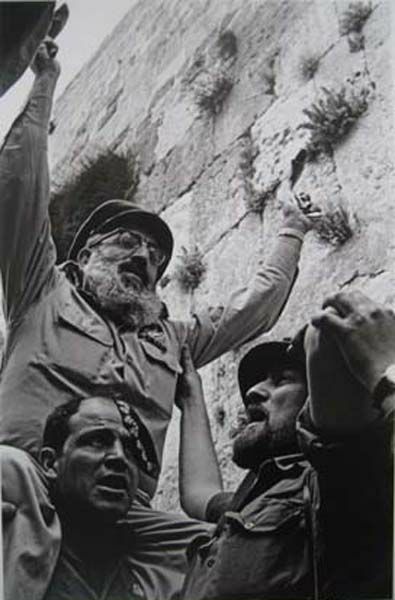 Moshe Stempel, the deputy brigade commander swept the Temple Mount with Company A (Zamush’s company) and proceeded towards the Western Wall. Before actually reaching it, he told Captain Zamush to send one soldier to hold it while they went back up and hoisted the flag Zamush had so faithfully and eagerly carried all this time. It was hung on the Temple Mount, overlooking the Western Wall and much of Jerusalem. The soldier Zamush ordered to take posession of the Western Wall and hold it was Sgt. Dov Gruner. Dov Gruner was born it is said, on the day his namesake and uncle was hung by the British. A famed Irgun fighter under Menachem Begin, Dov had refused to admit guilt or beg for mercy from the court. He smuggled a letter to his commander, Menachem Begin, which cannot but be quoted in full. I could have written in high-sounding phrases something like the old Roman “Dulce est pro patria mori”, but words are cheap, and sceptics can say ‘After all, he had no choice’. And they might even be right. Of course I want to live: who does not? But what pains me, now that the end is so near, is mainly the awareness that I have not succeeded in achieving enough. I too could have said: ‘Let the future take care of the future’ and meanwhile enjoyed life and be contented with the job I was promised on my demobilization. I could even have left the country altogether for a safer life in America, but this would not have satisfied me either as a Jew or as a Zionist. There are many schools of thought as to how a Jew should choose his way of life. One way is that of the assimilationists who have renounced their Jewishness. There is also another way, the way of those who call themselves ‘Zionists’ – the way of negotiation and compromise, as if the existence of a nation were nothing but another transaction. They are not prepared to make any sacrifice, and therefore they have to make concessions and accept compromises. Perhaps this is indeed a means of delaying the end but, in the final analysis, it leads to the ghetto. And let us not forget this: in the ghetto of Warsaw alone, too, there were five hundred thousand Jews. The only way that seems, to my mind, to be right, is the way of the Irgun Zvai Leumi, the way of courage and daring without renouncing a single inch of our homeland. When political negations prove futile, one must be prepared to fight for our homeland and our freedom. Without them the very existence of our nation is jeopardized, so fight we must with all possible means. This is the only way left to our people in their hour of decision: to stand on our rights, to be ready to fight, even if for some of us this way leads to the gallows. For it is a law of history that only with blood shall a country be redeemed. I am writing this while awaiting the hangman. This is not a moment at which I can lie, and I swear that if I had to begin my life anew I would have chosen the exact same path, regardless of the consequences for myself. The story of Dov and how he ultimately did face the gallows, despite Begin’s most desperate measures and broken British promises, is legendary in itself, but for our purposes here, ultimately he did meet the English hangman along with his brothers in arms Yehiel Dresner, Mordechai Alkahi and Eliezer Kashani. One wishes that he could have been told, that his own nephew, bearing his name, would enter first, armed, in uniform and representing the victorious IDF in the liberation of the old city of Jerusalem. But reading his letter one also knows that he already knew. Stempel was killed a year later while chasing terrorist infiltrators in the Jordan valley. Though wounded in the first exchange of fire, he had refused to be evacuated and continued to lead the operation and his men, from the front. The flag in the air, and Dov Gruner holding the Western Wall, Rabbi Goren, the IDF’s chief Rabbi was not far behind, blowing the Shofar, praying a Shecheyanu and an Yzkor for the fallen, and leading the paratroopers in chassidic dancing on the Temple Mount. Naomi Shemer’s new song was also sung, immediately attaining the solemnity of an ancient hymn. Captain Zamush escorted Rabbi Goren down to the Western Wall. There once again, there were prayers and song. The always thoughtful Captain had asked Major Menahem Ha-Cohen to go get Rabbi Zvi Yehuda Kook (whom Zamush had studied under), son of the legendary Rabbi Avraham Isaac Kook, and the venerable Rabbi David Cohen to the Wall. Rabbi Cohen immediately attended to intense prayers on the Wall, but Rabbi Kook remained in an odd state… speaking mundane trivialities to those around him and appearing non nonchalant in site of the wall. As the immense wells of emotion finally broke free of the shock and disbelief, Rabbi Kook wept openly as he embraced the holy ancient stones. 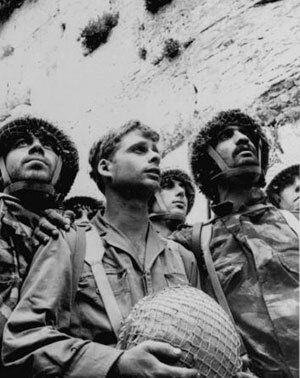 Most Paratroopers had wept at the Temple Mount, some if in not in awe and recognition of the magnitude of event, at the sight of their brothers, alive and well after so much hard fighting as they continued to gather inside the old city. Later, they would find out about so many who did not make it, but in the moment they could only see those alive. Some still, remained dried-eyed both at the Temple Mount and the Wall. Perhaps years of secular learning had made it difficult to be openly so emotional about stones after so much violence and so many dead. Perhaps it was just too much. The observant, and fate-loved Captain Zamush would yet again lead these last still stoic warriors to endless tears. Tears of joy and pride. Captain Zamush now moved from the Temple Mount towards David’s tower near the Yaffo Gate. From there he and his men mounted the fortified ramparts the Jordanians held facing Israeli territory and moved towards Zions gate. At this point, the Jordanians broke at seeing the IDF arrive so clearly from their rear. They had been fired upon for days, they were tired, and realized they were surrounded and cutoff. They had no more fight. The Jordanian soldiers, appeared to the citizens of the Israeli controlled western Jerusalem, silhouetted against the sky on top of the old city walls that directly faced them. For years the citizens had lived under the imposing walls, not only a symbol of what the nation had lost in the bloody war of 1948, which remained so close and yet so out of reach, but also of the fragility of the newly established state. From the old city walls Jordanian snipers brought death upon the new city in the west, to soldiers and civilians alike. The land directly in front of the border, dominated by the ancient walls, had to be given away as “artist colonies” because land so dangerous had no property value (quite a different story today for those fortunate “artists”). The civilian population of Jerusalem, shelled since the start of the war, sniped at and terrorized since 1948 from across no man’s land, and across the Hinnom Valley mow saw the familiar figures of the Jordanians with their helmets on top of the ramparts… but this time with their hands on their head, and the unmistakable silhouettes of the gallant if slightly swaggering Tzanhanim holding Uzis pointed at their new prisoners. The cheers from the city were indescribable. Time and time again the people down below broke into the national anthem, and children could hardly be stopped from running into no man’s land (still mined in many places) towards the paratroopers. Those who had maintained their composure at the Temple Mount, could not now as they too wept openly. The Generals, Central Command Chief Uzi Narkiss and our Minister of Defense Moshe Dayan. In all, about 179 IDF soldiers died in the Battle for Jerusalem. Two hundred casualties counting civilians. A tiny fraction compared to the endless thousands who have died for Jerusalem throughout the millennia. But another 179 of our best and before their prime nonetheless. About one thousand soldiers were wounded, and about half of all the casualties were among the Paratrooper’s Brigade. The Jordanians lost an estimated 330 soldiers in the battle and 100 civilians. During the infamous battle at Ammunition Hill alone, 24 paratroopers lost their lives as did 80 Jordanians. Of the 14 Tzanhan officers who fought on the hill, five were killed and 6 wounded. I feel that from all this horror and helplessness there arises within me a tremendous will to be strong, strong to the point of tears, strong and keen as a knife, composed and terrible and dangerous. This is what I want to be. I want to know that never again will those vacant eyes stare from behind electrified fences. They will not do so only if I am strong, only if we are all strong—strong, proud Jews. Only if we never again allow ourselves to be led to the slaughter. Whenever I see a terrified Jew, a picture or a word that reminds me of this, I regret every minute that I wasted in the army without taking the fullest advantage to become more efficient. These are the sort of men who made sure Jerusalem is our capital. They had no need for declarations, they paid for our eternal capital with fire and blood, and only wished us to be strong. Let us earn their sacrifices, and let us at least believe our capital is truly ours. Stempel tugged my body between himself and the lens. He hid his face so that no film could be made of his tears. So yes, it is very nice that Mr. Trump will finally declare that the US will recognize what is already a fact. We certainly appreciate the gesture, and I am especially impressed he was able to overcome the Israeli government’s hysteric objections (as I predicted would happen before Trump took office). Note that many Presidents have made the promise and none kept it so far. In fact, I assume that during his remarks, Mr. Trump may very well raise some similar points, or at least note that the Jerusalem is our capital already, and his declaration is not making it so. So I extend nothing but thanks and respects to Mr. Trump and his administration for this move, and for keeping his word. And I very much look forward to hearing his words. But don’t for a second forget a sense of proportion. That our mutually proclaimed “greatest ally” finally agrees to recognize the right of our state to chose its own capital within that state, a courtesy extended to all other nations on earth, is not so much an incredible kindness but a sign of how weak our political positions are. When it comes to Israel, we make everything debatable, from our capital being Jerusalem, to the very existence of the state of Israel and our very own right to exist and defend ourselves. This declaration is not shocking, it is shocking that it has taken so long. But declaration or no declaration, let us not forget what is what. Just like I have often explained that it is not the cursed 1947 UN vote that created Israel, but rather the victory of our heroes in the 1948 War, so it is not the declaration of the USA that makes Jerusalem our capital, but our own hearts and souls, guided by almighty Gd. It is reported that a young Senator from Delaware Joe Biden, in 1982 during Senate Foreign Relations committee testimony pounded his fists and threatened Prime Minister Menachem Begin with cutting foreign aid to Israel (he was already a whiny and loud mouth socialist back then). The same Menachem Begin who commanded the brave Dov Gruner and to whom Dov addressed his letter cited above. Don’t threaten us with cutting off your aid. It will not work. I am not a Jew with trembling knees. I am a proud Jew with 3,700 years of civilized history. Nobody came to our aid when we were dying in the gas chambers and ovens. Nobody came to our aid when we were striving to create our country. We paid for it. We fought for it. We died for it. We will stand by our principles. We will defend them. And, when necessary, we will die for them again, with or without your aid. This desk is designed for writing, not for fists. Don’t threaten us with slashing aid. Do you think that because the US lends us money it is entitled to impose on us what we must do? We are grateful for the assistance we have received, but we are not to be threatened. I am a proud Jew. Three thousand years of culture are behind me, and you will not frighten me with threats. Take note: we do not want a single soldier of yours to die for us. Several Senators remarked to the media after the testimony to have been deeply impressed by the courageous stance of Mr. Begin. (See Here and Here for some notes about original wording, but the above is widely quoted and reported). Mr. Begin of course, was famous for stating Israel’s position clearly and unapologetically, be it to Germans, to Americans or the Arabs, and he did it many times. He played his own crucial part in the liberation of Jerusalem during the Six Day War. He was instrumental in giving strength to the national unity government that it not waiver before Jerusalem had been taken, much as he had done in 1948 in giving Ben-Gurion the impetus to declare independence. So while we extend great appreciation for Mr. Trump, if he indeed goes on to do what is being reported, and would be finally happy to hear that our greatest ally actually recognizes our capital, let us remember what poor value that declaration of recognition is. We would never pretend to tell the USA that Washington DC is not their capital, despite the fact the land was clearly first taken from Indian tribes by brute force by the British and then in turn by traitors to that same British regime (as King George would see it at least) in successful violent rebellion. Most importantly, let us remember to stop debating our capital, our territory, and our very existence with our enemies, and let us instead rest assured that we indeed exist due to men like Captan Yoram Zamush, Lt. Ophir Fenegar, Deputy Brigade Commander Stempel, and Brigade Commander Motta Gur among many other heroes, and of course due to the likes of Dov Gruner, his nephew, Menachem Begin and Jabotinsky. I will take them over declarations any day and twice on Sunday. 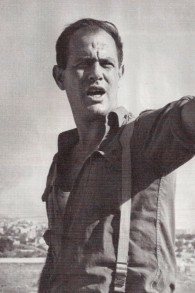 Major Yossi Langotsky, Commander in the Reserves for the Jerusalem Brigade’s elite Reconnaissance Unit, a dynamic and very intelligent figure who went on to pioneer the Israeli Oil Industry (and being forced out of his share just days short of their value being millions). Shimon ‘Katcha’ Cahaner Needs no introduction. 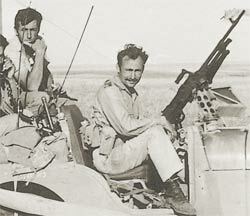 Legendary Paratrooper and Warrior, Meir Har-Zion (a younger Har-Zion in image) joined his friend Kapusta’s unit in the fighting.